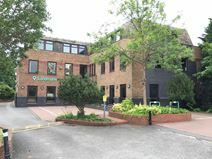 Situated in the heart of Hook village, this newly refurbished office space benefits from a great non-industrial estate location. Meeting room and boardroom hire is also available to tenants. The centre is owned by a local company who have been based in the area for several years. Their expertise in running a centre is second to none and the staff are there to be supportive and help businesses grow and develop. It is cleaned on a regular basis and an entry phone as well as post handling can also be arranged. The centre offers a meeting room that can be booked on an hourly basis. There is spacious, on site parking that will offer space for any guests visiting the centre. A kitchen is also based in the centre as well as modern bathrooms.